Facebook is scaling back a tool that could have allowed advertisers to exclude viewers based on their race. The social media giant announced Friday that its marketing tool allowing exclusion of viewers by “ethnic affinity,” which attracted heavy criticism after a ProPublica investigation in late October, would no longer be available for advertisers who promote industries that have a history of racial discrimination. Specifically, that means no more racial targeting for ads that pertain to housing, employment or credit offers. “There are many non-discriminatory uses of our ethnic affinity solution in these areas, but we have decided that we can best guard against discrimination by suspending these types of ads,” Erin Egan, Facebook’s vice president of U.S. public policy, explained in a blog announcing the changes. A screenshot of Facebook’s “ethnic affinity” tool, which allowed marketers to target certain groups with their ads. Facebook’s decision is smart, both in the sense that it no longer risks perpetuating inequity in three historically discriminatory fields, and that it helps the company avoid what could be very serious legal challenges, say legal experts. The policy shift is “a positive approach that moves them forward towards compliance with the law and that ensures they are not facilitating discrimination,” Jon Bauer, a law professor at the University of Connecticut who focuses on discrimination, told USA Today. 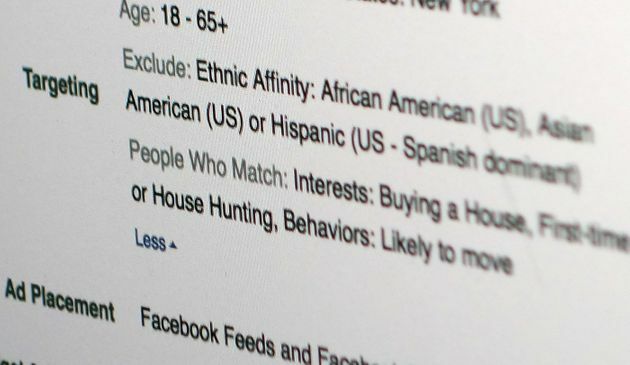 ProPublica’s report compared Facebook’s racial targeting abilities to a modern variant of Jim Crow-era ads, since they could permit property managers, for example, to only advertise apartments to white people.